Test Light vs. Multimeter...what do they actually do? PVC vs. GXL wire...feel the burn! HEI Mod - what's with the pink wire??? 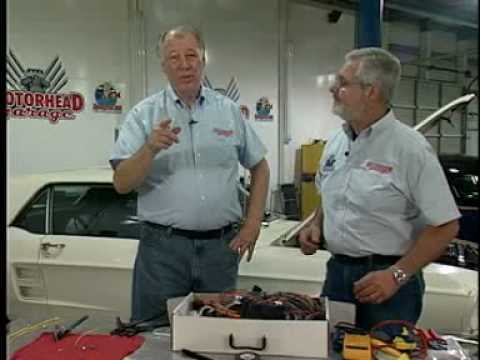 How do I know if my wiring system is from American Autowire? Mopar A Body Kit...Coming Soon! The elusive '68 Chevy Truck side marker "light"
It's just wire, right? Wrong. The new Factory Fit catalog is available NOW! The show(s) must go on! Plan ahead...don't forget the tools! Can my fuse box be reused? Gauges or Warning Lights...does it matter? Meet, "Secret Weapon", Tom Jettie! What do I need when installing a Classic Update kit? What do I need when I call Tech Support? Additions to the Production Team! "WHERE DO I PUT THE 3rd WIRE ON MY 1-WIRE ALTERNATOR?!" So what's in THAT Factory Fit harness? UNSURE IF THE CLASSIC UPDATE SERIES IS THE BEST SOLUTION? 2 new Classic Update kits are available NOW! AAW "mobile" is here for smart phones and tablets! Good Guys Nashville Nats this weekend! 2 New Products on the way! Spring Carlisle is almost here! Come see us at the Northeast Rod & Custom Car Show! The Hotrod & Restoration Show is right around the corner! American Autowire @ the Hotrod & Restoration Trade Show! ROUTE 9 Universal Wiring System coming on 5/27/2016!! !